Malt is delivered from our primary supplier, Briess Malting Company, in two ways. Our base malt is delivered in bulk form and blown into our 60,000 pound storage silo. Specialty malts are received in 50 pound bags. Malt is augered from the silo to the 2-roll malt mill. The malt is gently crushed between the rollers of the mill to separate the husks from the starches. The crushed malt is augured from the mill into the mash mixer where it is combined with water. Enzymes degrade the starches to sugars and dextrins. The temperature of the mash is maintained and adjusted for optimal enzymatic activity. The mashing temperature profile varies by the style of beer being brewed. The mash is pumped from the mixer to the lauter tun where the sugars are extracted from the insolubel husk filter bed. Hot water is sprayed over the grain bed and clear wort is allowed to run into receiving grant. The clear running wort is pumped from the grant to the kettle. The wort is boiled for approximately 90 minutes during which time hops are added. During wort boiling, bitter and aromatic hop components are added and large protein groups (trub) are formed. Hot wort is pumped tangentially into the whirlpool. The rotational motion of the wort causes the trub to settle in a cone in the center of the whirlpool where it can be removed. The hot wort is drained from the whirlpool and pumped through a plate heat exchanger. The temperature drops from 190° F to 45° or 60° F, depending upon if the beer being produced is a lager or an ale. The cooled wort is injected with pure hospital-grade oxygen to provide an environment for proper yeast multiplication. The cooled wort is pumped into fermenters where yeast is then added. The yeast converts the sugars into alcohol and carbon dioxide. When fermentation is complete, the yeast settles to the bottom of the fermentation vessels. The beer is pumped from the fermenter through a diatomaceous earth particle filter. The filtration removes yeast and other particles that might limit the shelf life of the beer while ensuring clarity. 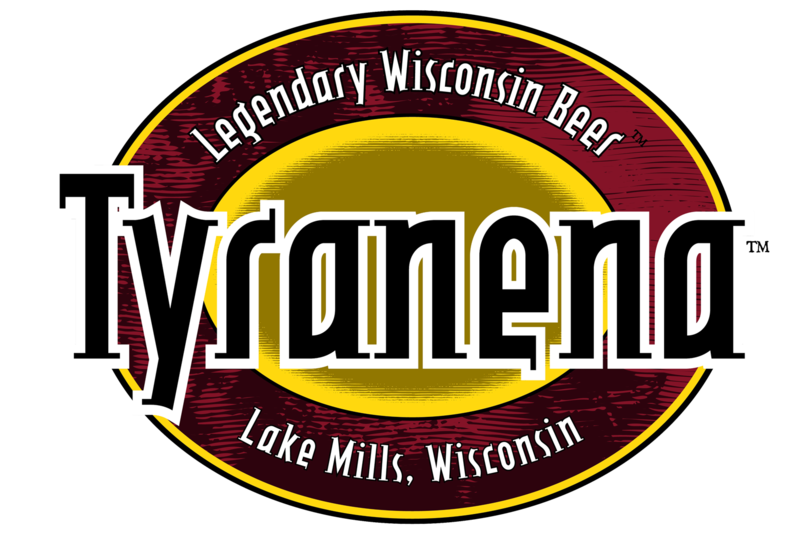 Founded in 1998, Tyranena Brewing Company began operations on October 21, 1999. And our Tasting Room opened its doors for the first time on Friday, November 12, 1999. Conveniently located 25 minutes from Madison and 50 minutes from Milwaukee in the small Wisconsin city of Lake Mills (combined population, township & city, of 7,778 in 2010). The brewery uses a modern 6-vessel, 30-barrel Sprinkman brewhouse with a production capacity of 45,000 barrels. Current fermentation capacity (10 60-barrel Sprinkman/Walker cylindroconical fermenters) limits actual production. A long-tube SMB filler and bottling line fills 2 cases per minute.